My Chinese Master Stock and Sunday Gravy projects both exemplify a culinary process whereby a cooking medium is slowly developed over a long period by successively cooking various ingredients so that they derive flavor from the medium and, in turn, add their flavor to it in successive layers of taste. The Chinese and Italian recipes I played around with are both useful and fairly versatile, but they are also somewhat limited in application given their color and basic flavorings, and I have long wanted to create a more generic medium that can easily be adapted to a much wider range of uses. 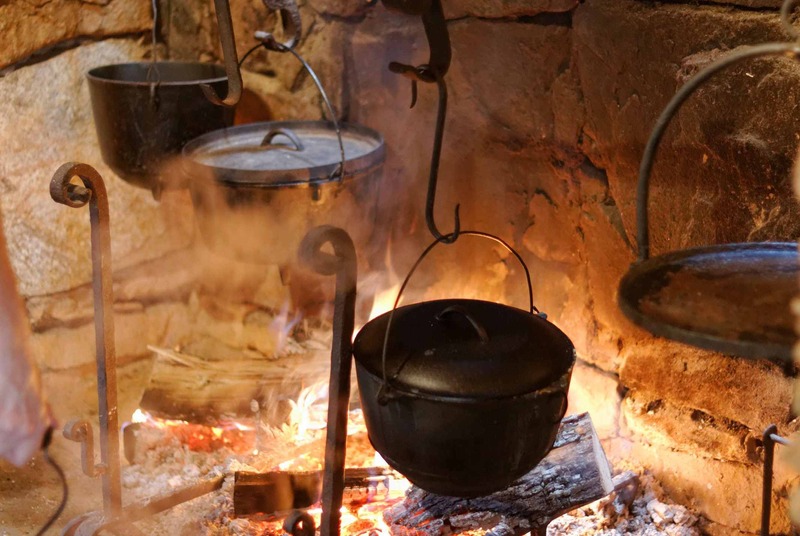 The idea of a perpetual stockpot continually simmering away on the back of the stove or fire is as old as kitchens themselves and, in times past, a cauldron could be kept simmering as an ever-changing, pot-luck sort of stew whose ingredients would be replenished with whatever was on hand at any given time. Indeed, the French Pot-au-Feu, although now made as a specific meal, has its roots in the medieval tradition of a perpetual stew. 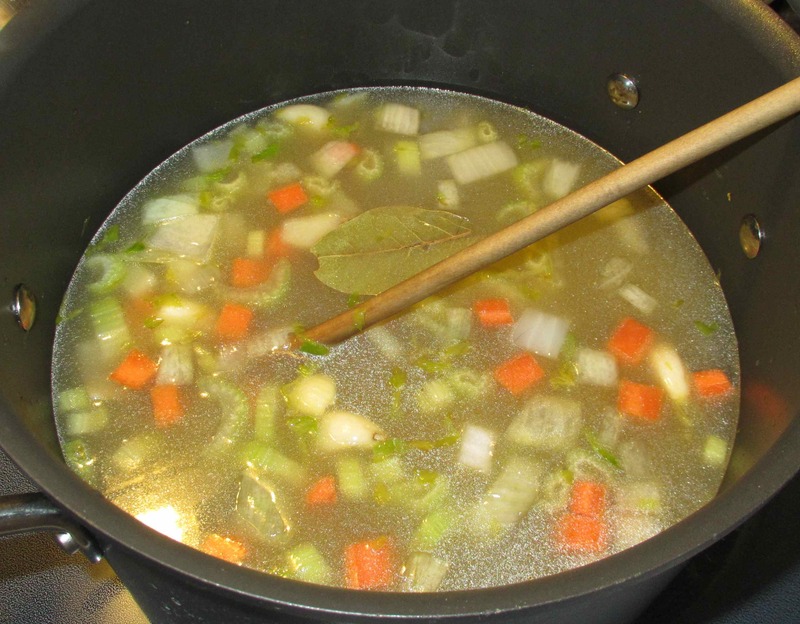 I want to keep my stock as versatile as possible and I am thus going to employ plain, but flavorful meats, simple vegetables, and not much in the way of strong herbs or other seasonings that might limit the way the stock can be used. Not only will I try to keep the flavors simple (albeit robust) but I want to keep the color as light as possible too. I have decided to prepare the base in three stages over two days. 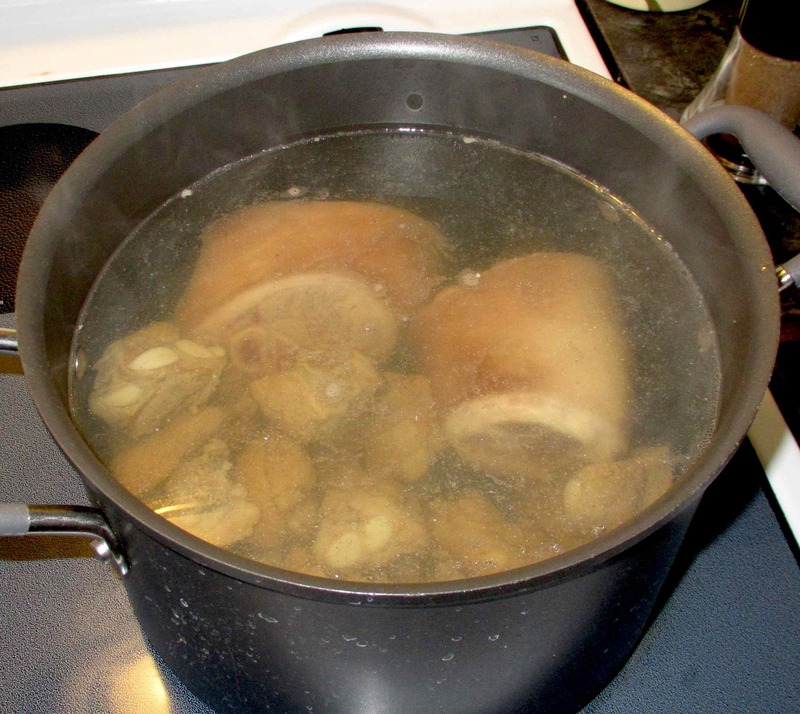 The first stage will be the formation of a meat-only broth using rich cuts that will create lots of flavor and body. 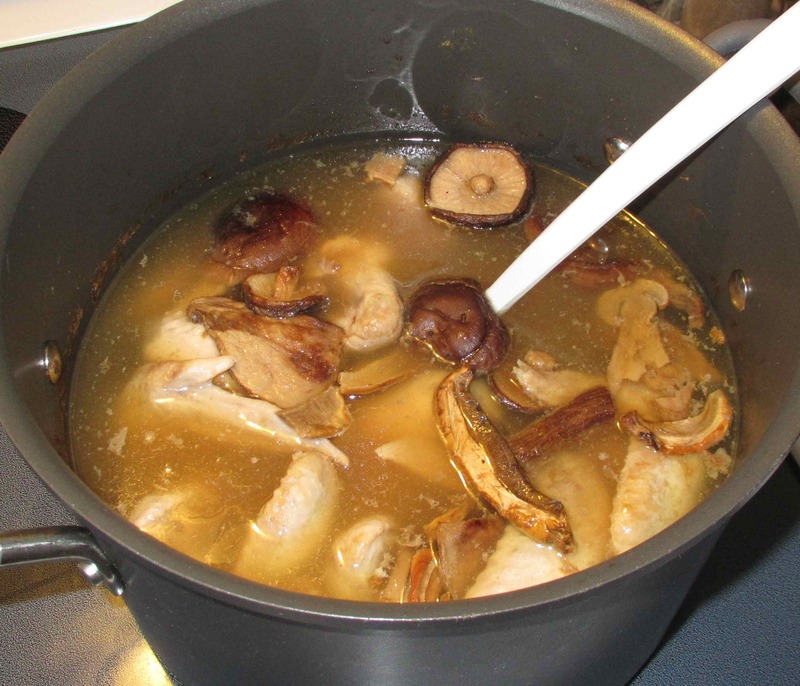 At the second stage, I will use onions and root vegetables to augment the filtered first stage broth, and lastly, I plan to round out the product using chicken wings to add extra gelatinous richness (as well as flavor), as well as a little wine and dried mushroom. DAY ONE: These are the meats I am using at the first stage. 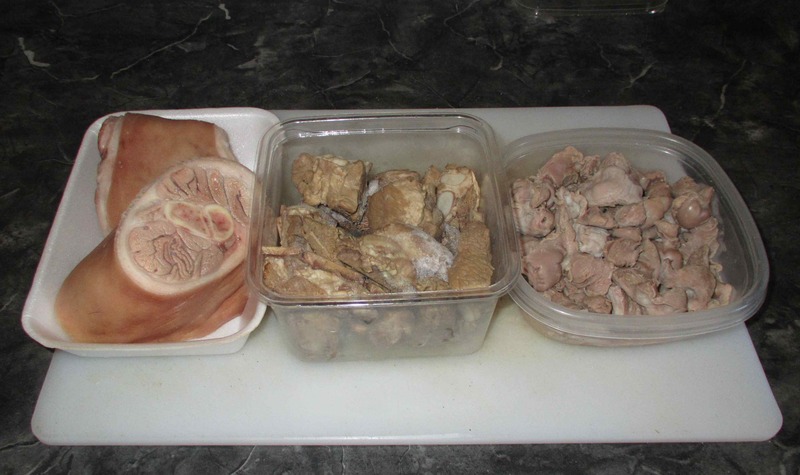 I am using two good sized pork hocks, a pound and a half of pork side-ribs and a pound of chicken gizzards. As always, when I make stocks, I have briefly blanched the meats in boiling salted water and then rinsed them thoroughly to remove any scum or detritus. This will help us achieve clarity in the final product without lots of skimming and filtering. For the first step, I am using about 4 quarts (liters) of water. I brought the water to a light boil and then added the meats. This immediately lowered the temperature but I didn’t allow it to come back to a boil but, instead, just kept things at an even simmer for the remainder of the cooking time. After about 4 hours, I removed the meat and strained the stock through cheesecloth. By this time, it had reduced to a little over 2 quarts. I reserved some of the meat for cat treats while the larger fattier bits went to feed the Ravens. 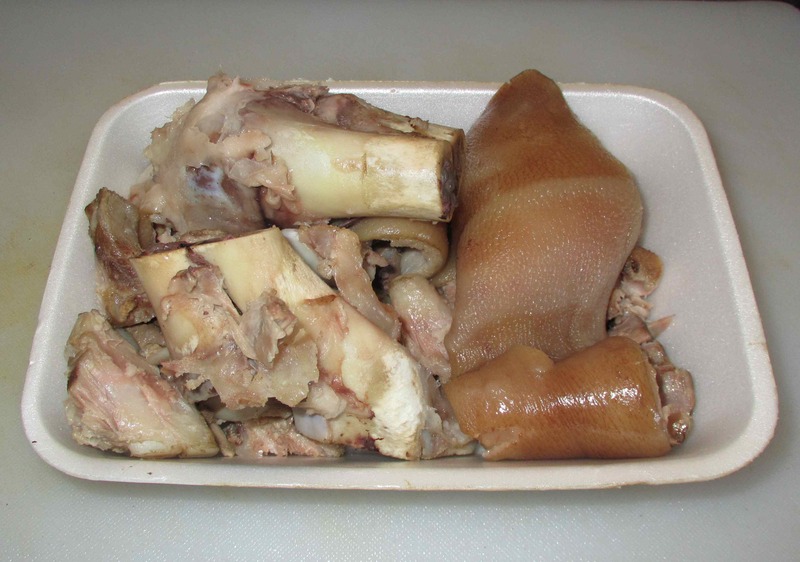 I kept the bones and cartilage from the ribs, as well as the bones and skin from the hocks as these still have goodness and the skin will add quite a bit more collagen to enrich the final product. 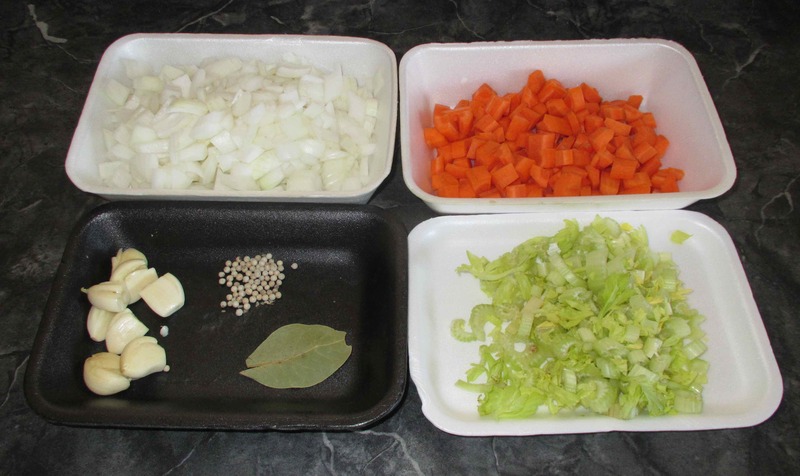 For vegetables, I am using 3 cups onions, 2 cups carrots and 1 cup celery, along with 8 garlic cloves (peeled and crushed), and some white peppercorns and a bay leaf for seasoning. I thought about roasting the vegetables as this makes for a sweet and pleasant flavor but it also makes a darker stock than I want. Accordingly, I am going to sauté everything in a little butter and olive oil to begin the release of the flavors and sweeten things a little. I began by sautéing the garlic and peppercorns in a tablespoon each of olive oil and butter and then added the carrot. After a few minutes I added the celery, gave this a few minutes longer and added the onion. 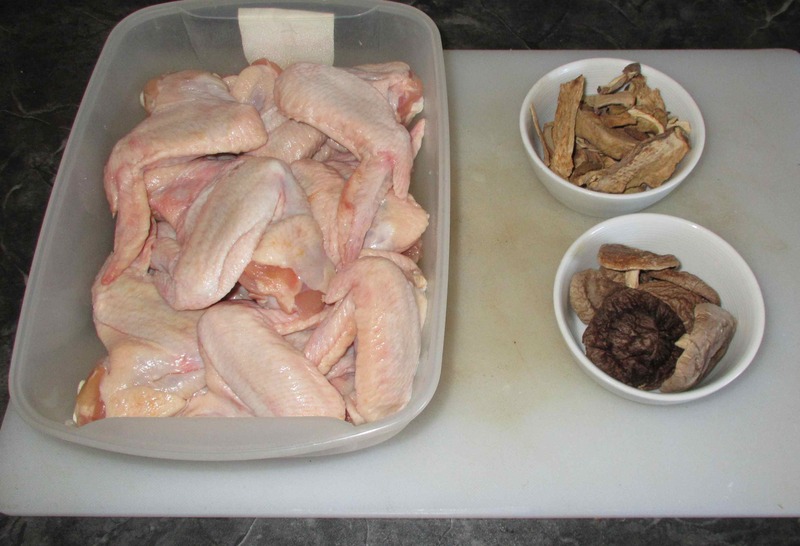 DAY 2: For the third stage of the process, I am using 3 pounds of chicken wings, a quarter cup of dried Porcini mushrooms and 8 dried Shiitake mushrooms. I will also be adding 2 cups of dry white wine and just a splash or three of sherry to round out the acidity of the wine. 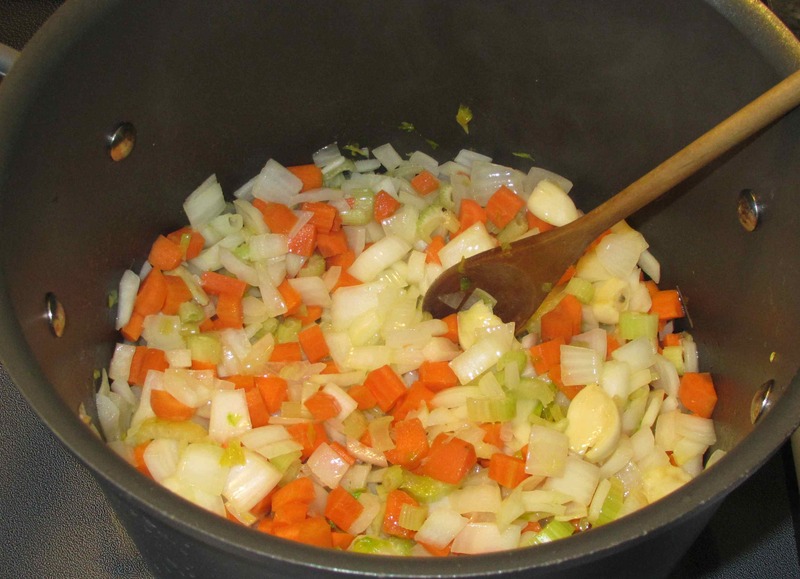 The stock, following the second stage, had reduce again to 2 quarts and was considerably more murky than I liked. I rather think this happened because I accidentally allowed the pot to come to a boil after covering it and neglecting to turn down the heat to compensate. Luckily, after straining off the veggies, a quick and vigorous re-boil actually cleared it by forcing a good deal of matter to come to the surface as a scum that was easily removed. In any event, I added the wings, mushrooms and wine, along with a quart and a half of water to bring the level to 4 quarts once again, and put the pot on simmer for 3 and half hours. Here is the finished stock base. It is a little darker than I hop but the clarity isn’t bad, especially considering the amount of vegetable used. The taste is also pleasing and I am confident it can only improve as things develop over time. DAY 3: After being refrigerated overnight, I was pleased to see that the stock has gelled nicely from the pork skin and chicken wings. 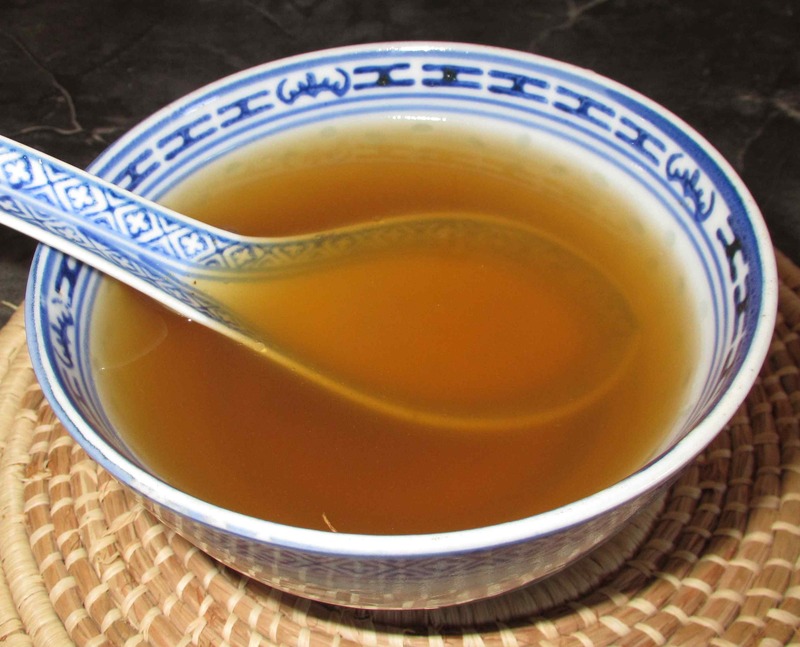 As with my Chinese Master Stock, the broth will need to be brought to a boil every few days to keep it fresh (or frozen periodically if that cannot be done regularly). Fire-pot Rib and Corn Soup. Gorgeous, John! What a terrific idea to blanch the meat the first time around. I always get the best tips from you! It’s almost always done in Chinese and Japanese cookery. I do it as a matter of course now! Very nice approach, John, and I imagine this is very flavorful. 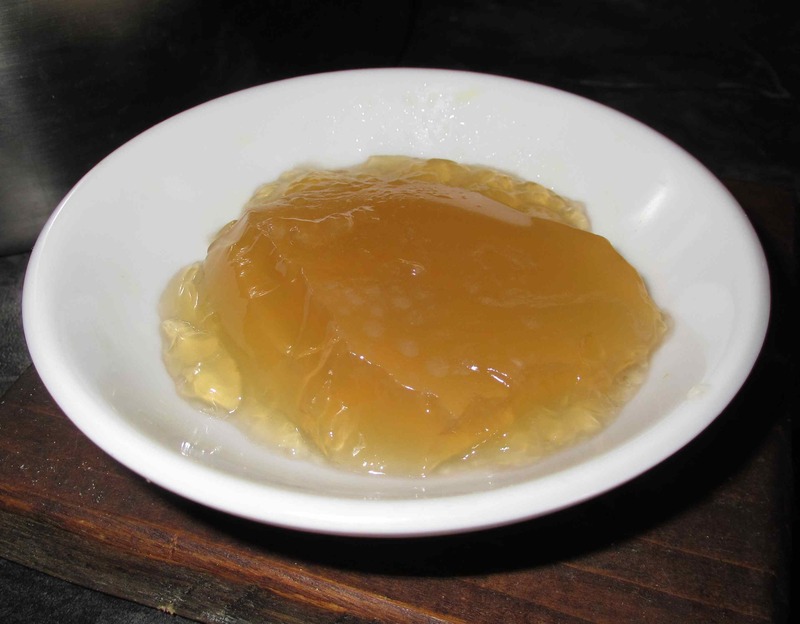 Have you ever tried using raw eggs blended into the liquid to help clarify the stock? As it cooks, it forms a raft on top of the liquid and filters out particulates. If you were so inclined to try it, in this approach, I would add it on the third step. I actually have used the ‘raft’ technique, Richard … only using the whites though. You can mix egg white and the crushed shells with some chopped veggie (carrot, celery etc), and let it sink to the bottom before you start heating the stock. Mostly this time consuming process is beneficial if you are serving a consomme or the like, where absolute clarity is important for visual appeal.. although I have used it to rescue a batch that was really getting too cloudy.